The ANPRnow camera has integrated GPS, WIFI and 3G/4G allowing live upload and backup buffering to provide up to one million cached reads, uploads via an API supporting JSON, FTP, UTMC1.2 and BOF2 Web Services. Futronics have developed, built on MAV technology, this unique "Plug & Go" ANPRnow camera in response to many requests over the years for a reasonably priced and easily deployable product. 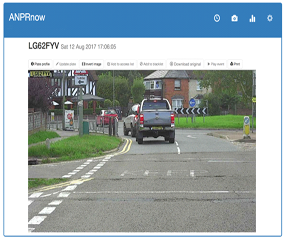 This enables the client to deploy the previously expensive ANPR facility to many more vehicles and because it requires no installation the deployment can be expanded to any car or commercial vehicle. At it's base level the ANPRnow camera can be used for data gathering, requiring no input or action by the driver. A single windscreen camera can read multiple lanes at once. Thanks to the advances in technology and reductions in component costs we have been able to develop the ANPRnow camera using the latest in processing and camera offerings available today.